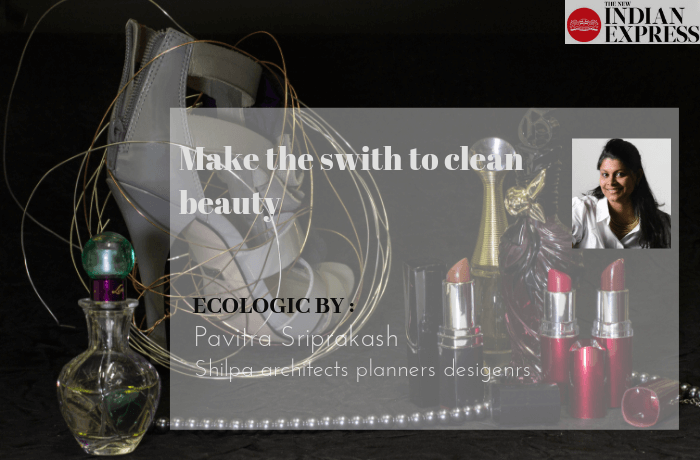 21-Mar-2019: Pavitra Sriprakash, Director and Chief Designer at Shilpa Architects Planners Designers writes a weekly column on Sustainability for The New Indian Express titled “ECOLOGIC”. This week she writes about clean beauty and how it’s safe, healthy and planet friendly….. This week I wanted to focus inwards — do we know how many chemicals are absorbed into our systems? Do we know what really lives in those bottles on our shower ledges and counter tops? These products are dabbed and sprayed as part of getting ready — it’s all in a day’s work as they are mindlessly slathered onto our bodies for our eyes, lips, skin and scalp to absorb. Clean Beauty is a recent movement that addresses the beauty industry the same way “Organic” and “Natural” does for food. While the move to clean beauty is analogous to the move toward fresh, toxin free products there are important differences that any conscious consumer needs to know when confronted with a decision of whether to go clean or not. When it comes to daily routine, most of us cannot imagine doing without an antiperspirant and deodorant in a hot and humid place. Antiperspirants contain an “aluminium-based compound” which is a major carcinogen and has several studies listed linking it to breast cancer. Direct contact of these compounds with your body’s most critical detoxifying area: your underarms — an area loaded with lymph nodes and sweat glands makes us more vulnerable to absorption compared to skin elsewhere on the body. A great switch is to a natural alum which is the main ingredient in a few of the ‘crystal deos’ found popularly in SoutheastAsian countries and being used in Ayurveda through the ages. You eat a large percentage of whatever you put on your lips — so in the case of lipstick and lip balm consider making a switch! In the case of conventional lipsticks, you’re consuming dyes that aren’t even allowed in food! So, when going clean, look out for nourishing elements. Hair products are among the most toxin-loaded in the beauty industry. Powerful fragrances and sulfates, endocrine-disrupting preservatives, potentially carcinogenic plasticisers and dyes are common ingredients. Clean shampoos will not contain sulfates and parabens; clean conditioners rely on natural oils and butters as opposed to silicones and plasticisers. Another product are the vibrant and multi colored hair dyes — no ammonia doesn’t mean it is totally acceptable. Be wary of the word ‘fragrances’ these are usually unconvincing and deliberately confusing. As a conscious consumer look for products with complete ingredient lists — when it comes to clean beauty, remember — the shorter the better!